The beautiful natural landscapes of Oaxaca, Mexico teem with birds and wildlife, making this an excellent travel destination for nature lovers. Oaxaca—pronounced wah-HA-kah—is the 5th-largest of Mexico’s 31 states, but it ranks numero uno for having the greatest number of animal species. For example, 741 bird species have been found in Oaxaca– about 67% of the species found in Mexico. There are also hundreds of native mammals in Oaxaca and the state is home to more reptiles and amphibians than anywhere else in the country. 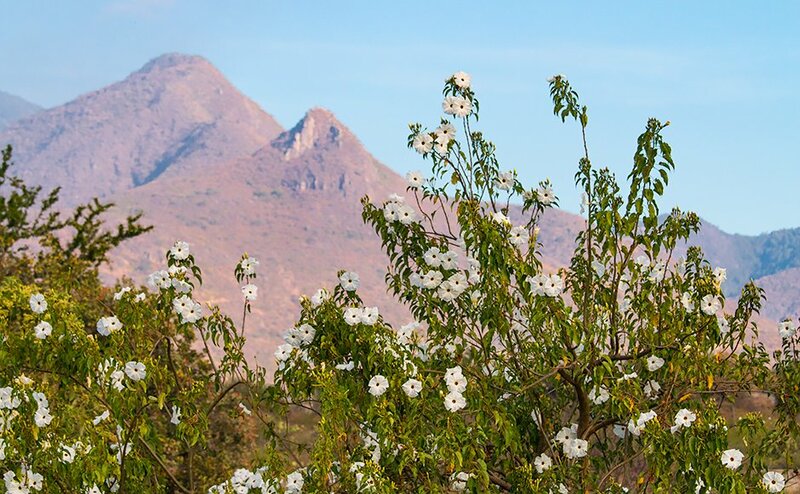 This high level of biodiversity is due to Oaxaca’s rugged topography, its diverse ecosystems, and its position close to a narrow “pinch-point” on the North American continent: the Isthmus of Tehuantepec. This is the narrowest stretch of land that separates the Gulf of Mexico and the Pacific Ocean. 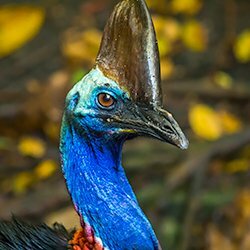 Dispersing birds and other animals from the north and south, as well as plants, have been funneled through this region for millions of years. Oaxaca is the convergence point for several major bird migration routes: the Pacific, Central, and Mississippi flyways. Millions and millions of migratory birds pass through Oaxaca every year as they move between North, Central, and South America. 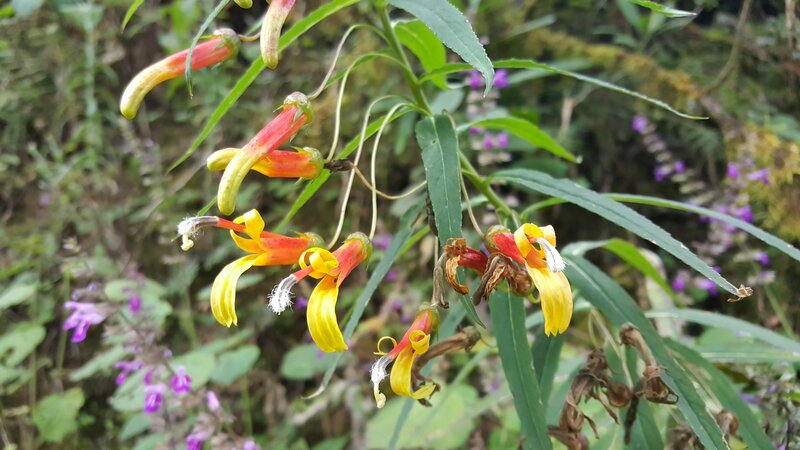 Sierra Madre lobelia (Lobelia laxiflora) in the mountains above Oaxaca City. All of this rich animal and plant life is found across a geologically active and diverse landscape, full of beautiful scenery. Oaxaca is also a major center of indigenous Mexican culture, particularly traditional artwork and crafts, as well as ancient ruins. No wonder Oaxaca is such a great to place to visit for people who love nature as well as learning about other cultures! Mangroves forests grow along parts of Oaxaca’s coast, particularly where there are brackish lagoons. These ecosystems harbor many species of birds and wildlife. The best— and often only— way to explore these forests is by boat. 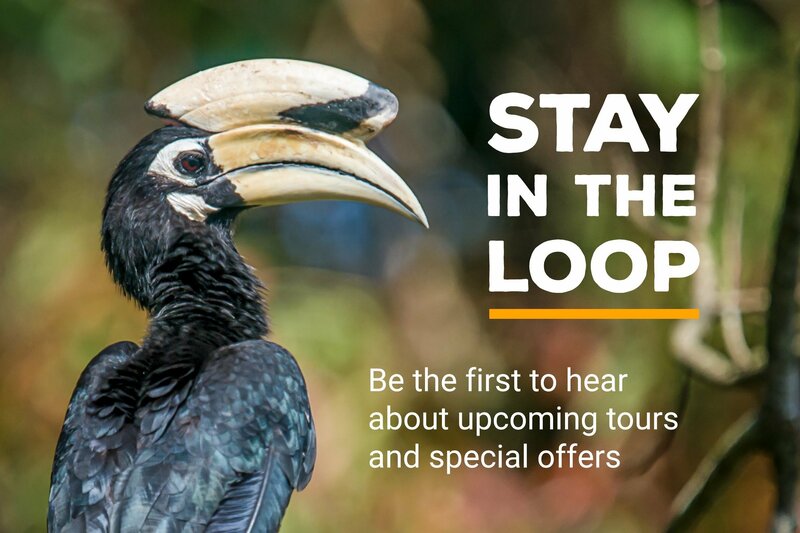 Hire a knowledgeable local guide to take you into the mangroves and you’ll have opportunities to see secretive wildlife that most tourists never see. The best places for a mangrove boat ride are at Manialtepec Lagoon and Lagunas de Chacahua National Park. 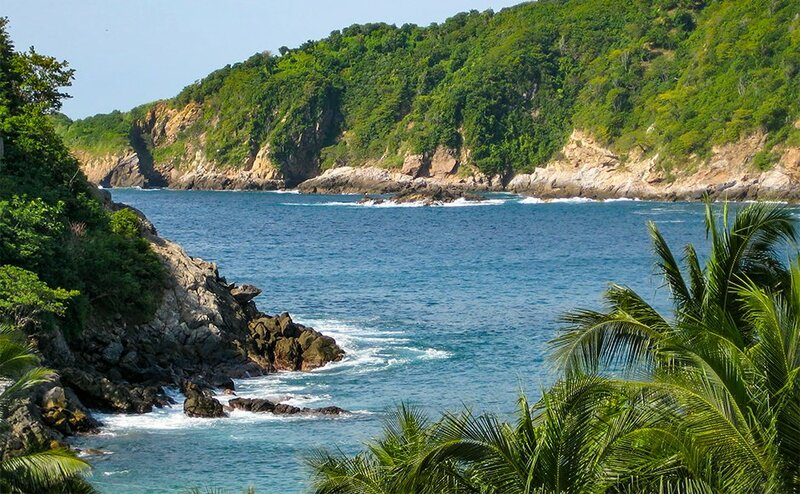 Go snorkeling along the beautiful coastline or search for exotic birds and mammals in the scrubby forest of Huatulco National Park. It protects a large patch of the vegetation that used to be common along Oaxaca’s Pacific Coast. To maximize your chances of seeing wildlife and learning about the ecosystems in the park, you can hire a local guide out of the nearby town of La Crucecita. This geologic wonder is found at the end of a winding dirt road in the mountains east of Oaxaca’s Central Valley, . Natural springs seep from the bedrock and leave behind white minerals. The water spills over the edge of a high cliff. Over millennia, the mineral formations of Hierva el Agua look like a frozen waterfall made of stone. Local people reinforced the natural pools, and many visitors take a dip when they visit. The water is cool, so wait for a hot day to go swimming here. Situated between about 15 to 18 degrees latitude, Oaxaca is well within the tropics. At low elevations along both the Pacific Ocean and near the Gulf of Mexico, temperatures and humidity can sometimes be high, but ocean breezes help moderate the weather. Temperatures elsewhere in the state are milder than might be expected at these latitudes because so much of the landscape sits at higher elevations. Snow and ice are almost unheard of in the mountains, but high-elevation locations are still cool and wet. Although seasons in the tropics aren’t quite as dramatically different as they are in the temperate zone, much of Oaxaca has two contrasting seasons: the rainy, mild summer and the dry, warm winter. Oaxaca City is 5,102 feet above sea level. It experiences warm, dry winters and wet, mild summers. Oaxaca is a mountainous region. It marks the place where two major ranges come together in a geological jumble: The Sierra Madre del Sur and Sierra Madre de Oaxaca. The latter range is known locally as the Sierra Norte and is an extension of the much larger range known as the Sierra Madre Oriental. The slow-motion grinding together of the Cocos and North American tectonic plates thrust up these mountain ranges over millions of years. The Cocos Plate is moving northeast and is being thrust underneath the North American Plate. The Middle America Trench, a deep undersea canyon running parallel to the Pacific Coast, marks where the Cocos plate is sinking. Powerful earthquakes occasionally shake the region, demonstrating that tectonic forces are still at play. The highest peak in the state is the 11,220-foot Cerro Zempoaltepetl in the Sierra Norte. The material that makes up the Sierra Madre de Oaxaca and the Sierra Madre del Sur is mostly ancient metamorphic rocks mixed with more recent igneous rocks (formed from lava or magma). There are no active volcanoes in Oaxaca, though there are plenty to the north of the state. Despite its mountainous nature, Oaxaca has flat land here and there. This can be found at both low and high elevations. Along the southern margin of the state, there is a relatively narrow strip of coastline with alternating sandy beaches and rocky headlands. Lowlands also occupy the northern fringe of Oaxaca. Nestled within the mountains are Oaxaca’s relatively flat central valleys. Elevations in these high valleys range from roughly 4,500 to 5,500 feet. This is where Oaxaca City– the state’s largest population center– is located. The mild and sunny climate of these interior valleys has attracted people for thousands of years. Sediments from the surrounding mountains have partially filled in the valleys, forming soil good for growing corn, wheat, beans, peanuts, sorghum, and other crops. Some of the earliest evidence of corn cultivation has been found in Oaxaca. At elevations between 7,000 and 10,000 feet in the mountains of Oaxaca, you’ll find ecosystems dominated by a mix of pine and oak trees. 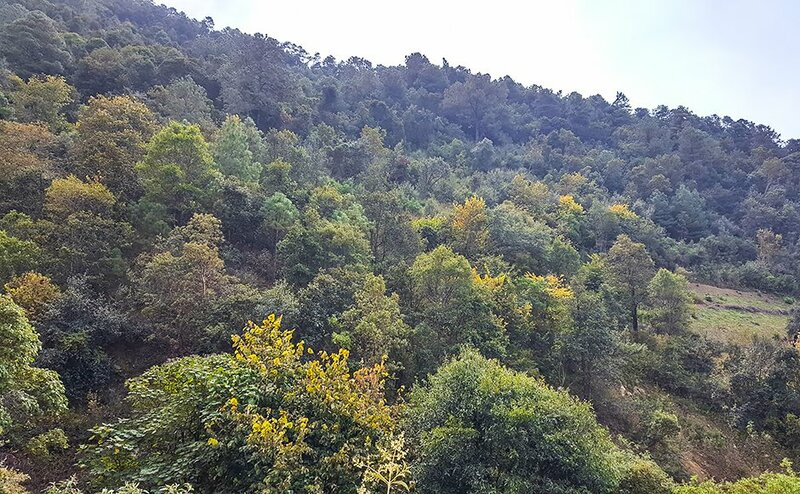 These temperate forests are the most extensive type of vegetation in Oaxaca. They are a component of the more expansive Southern Sierra Madre ecoregion. Pines are more common in cooler, wetter areas of the mountains, while oaks prefer somewhat drier sites, such as inland slopes that face away from the Pacific Ocean or slopes at lower elevations. Small, scrubby oaks dominate the interior foothills where no pines will grow. 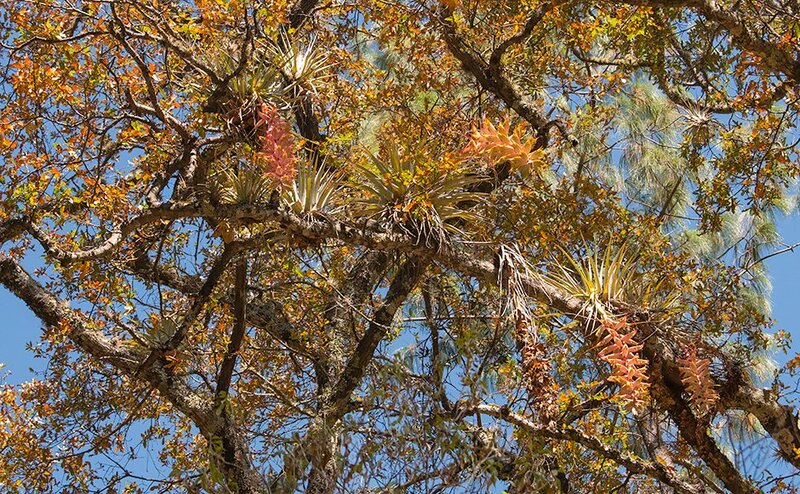 There are over 10 pine species in the mountains of Oaxaca. Some of the more common species are Montezuma Pine (Pinus montezumae), Mexican White Pine (Pinus ayacahuite), and Chiapas White Pine (Pinus chiapensis). Oaks, too, are diverse here, with well over a dozen species. Examples include Yellow Oak (Quercus castanea)–a tall and deciduous tree– and Netleaf Oak (Quercus crassifolia), which some call Encino chicharrón for the similarity between the tree’s leaves and chicharrones: fried pork rinds in Mexican cuisine. The mountains are also home to Mexico’s National Tree, the Montezuma Cypress (Taxodium mucronatum). Growing around, under, and sometimes on the pines and oaks are many other plants. Ferns, bromeliads, agaves, and hundreds of colorful wildflowers bring a touch of lushness and extra beauty to the high mountains. These smaller plants and trees provide food and shelter for countless animals. Interesting animals of the pine-oak forests include several mammals: White-nosed Coati, White-tailed Deer, and Central American Red Brocket Deer. Rarely seen wildcats like the Puma and Margay stalk prey in the undergrowth. 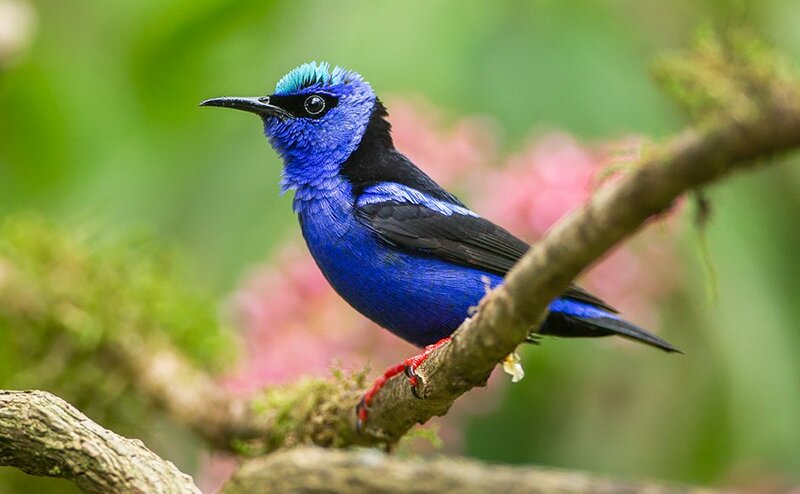 Some birds you might see flitting around in these montane forests are Mountain Trogon, Blue Mockingbird, Elegant Euphonia, Red Warbler, Berylline Hummingbird, Azure-crowned Hummingbird, and the nearly endangered, endemic Dwarf Jay. The latter species is found only in Oaxaca. Reptiles you might see here include the beautiful Southern Crevice Spiny Lizard (Sceloporus aureolus) and Emerald Spiny Lizard (Sceloporus formosus), as well as the Oaxacan Pygmy Rattlesnake (Crotalus ravus ssp. brunneus). Delicate amphibians are abundant in the right micro-habitats. The Shiny Peeping Frog (Eleutherodactylus nitidus) hunts small insects among dry leaves on the forest floor. Many amphibians, like Cochran’s False Brook Salamander (Pseudoeurycea cochranae), are vulnerable to habitat loss because they strongly depend on pine-oak habitats, which has been lost in many places because of logging. Valley scrub may be the most familiar ecosystem to many residents of Oaxaca City and to tourists who visit the region. It is found at elevations between 4,500 and 5,500 feet, in plateau areas where precipitation from the oceans is largely blocked by the surrounding mountains. Because this ecosystem is native to the central valleys of Oaxaca (sometimes referred to as the singular “Oaxaca Valley”) it has been heavily modified by humans living and farming in the area for thousands of years. The native vegetation comprises plants that can tolerate the semi-arid conditions of Oaxaca’s interior valleys. The trees are mostly small and stunted. Shrubs, cacti, yucca, agave, and grasses are dominant. At least 10 species of Morning Glory plants grow in the valleys. One of these is the Cazahuate (Ipomoea pauciflora), a common species that grows as a large shrub or small tree. It sports large, conspicuous, white flowers in November and December. One example of the more than 30 species of cactus species in the valley scrub is the huge Garambullo Blanco (Myrtillocactus schenckii), a many-armed, tree-like succulent plant. It has lovely, white flowers that sprout along prominent ridges that run up and down the length of each arm. Animals in the valley scrub ecosystem are a hardy bunch, like their botanical counterparts. Mammals here include Coyote, Gray Fox, Red Squirrel, Virginia Opossum, rabbits, and the elusive Ringtail. Seeing any mammal larger than a squirrel is uncommon in Oaxaca’s high valleys. Many have been displaced by human activity or actively hunted. The resilient mammals that remain are secretive and nocturnal. Birds are plentiful here and easier to find than mammals. The flashy Vermillion Flycatcher is one of the most colorful and conspicuous birds. White-throated Towhees, Bridled Sparrows, and Oaxaca Sparrows forage among the valleys’ shrubs and cacti. Other notable species are Ocellated Thrasher, Gray-breasted Woodpecker, and Boucard’s Wren. Over 60 species of reptiles live in the valley scrub ecosystem of Oaxaca. The most commonly seen species is the Eastern Spiny Lizard (Sceloporus spinosus). Sack’s Giant Whiptail Lizard (Aspidoscelis sackii) is found nowhere else but in the high valleys of southwestern Mexico. The Oaxacan Coral Snake (Micrurus ephippifer) is a beautiful reptile that is also endemic to this region. The dry environment of the central valleys isn’t ideal for amphibians. Nevertheless, at least 25 species are found in the valley scrub and foothills. More common amphibians here include the Southern Highland Tree Frog (Hyla euphorbiacea), the Mexican Treefrog (Smilisca baudinii), and the Giant Toad (Bufo horribilis). Most amphibians are easier to find in the rainy season, from June through August. Along the Pacific Coast, south of the Sierra Madre del Sur, the natural vegetation is dominated by small trees and shrubs. Many of these plants are deciduous, losing their leaves during the driest time of year, from November to May. 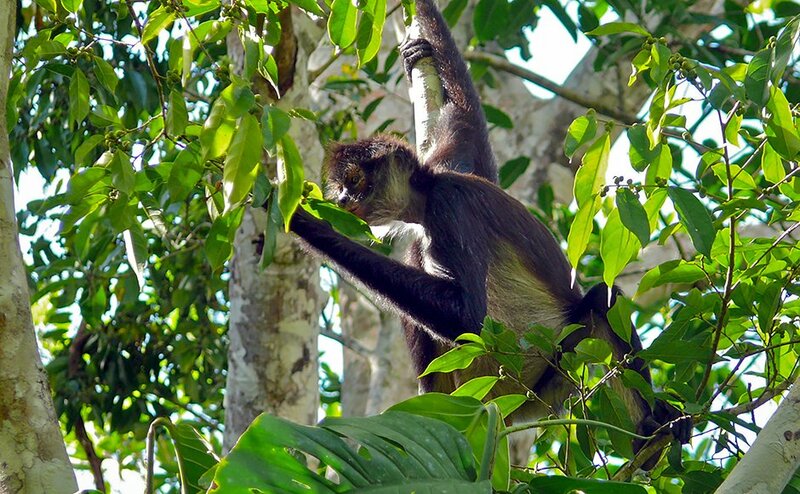 The Tropical Deciduous Forest supports a wide diversity of animals, many of which have ancestral roots in more southerly regions. For example, the Northern Tamandua is an arboreal (i.e. 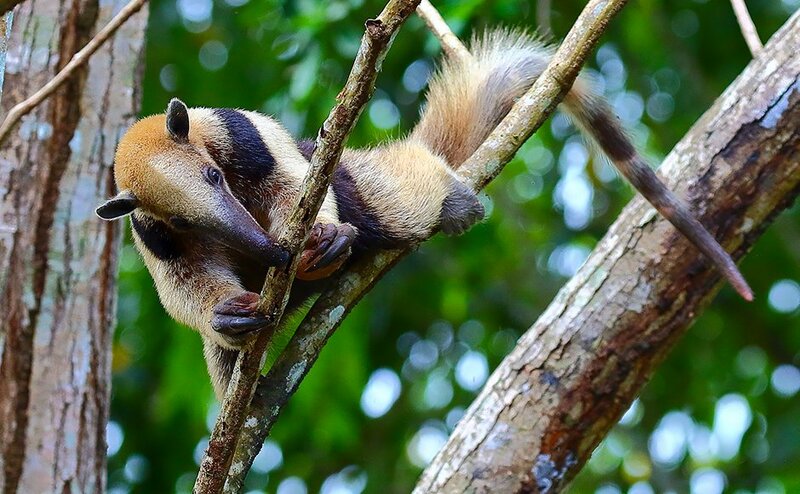 tree-climbing) anteater whose range is mostly to the south, in Central America and northern South America. The scrubby tree species that make up this forest include Rosa Amarilla (Cochlospermum vitifolium), Silk Cotton or Kapok Tree (Ceiba pentandra), Pacific Coast Mahogany (Swietenia humilis), and Mexican Plumeria (Plumeria rubra). Some– like Bullhorn Acacia (Acacia cornigera), Kapok, and the tree-like Cactus árbol del matrimonio (Pereskia lychnidiflora)– have wicked thorns or spines. The Northern Tamandua, mentioned above, is one of the interesting mammals found along Oaxaca’s tropical Pacific Coast. 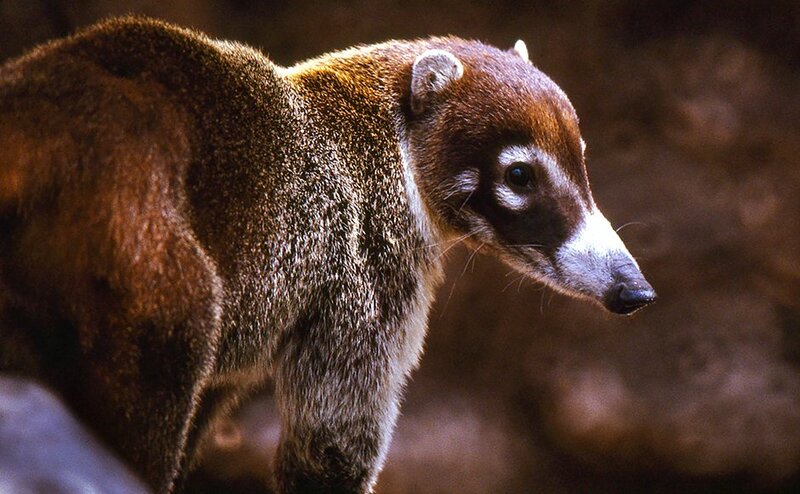 Others that might be encountered in the deciduous forest ecosystem are the Red-bellied Squirrel (very common), White-nosed Coati, Pygmy Spotted Skunk, and Nine-banded Armadillo. 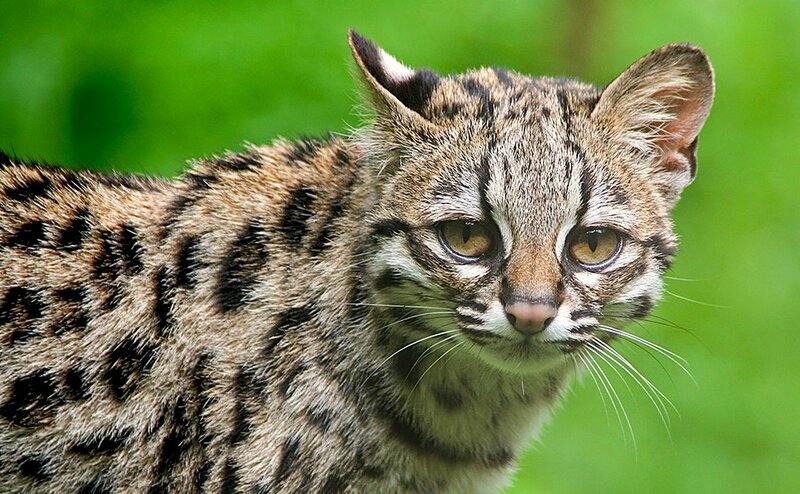 A rare possibility is the beautiful Ocelot, a small wildcat that hunts iguanas and other animals in the forest. 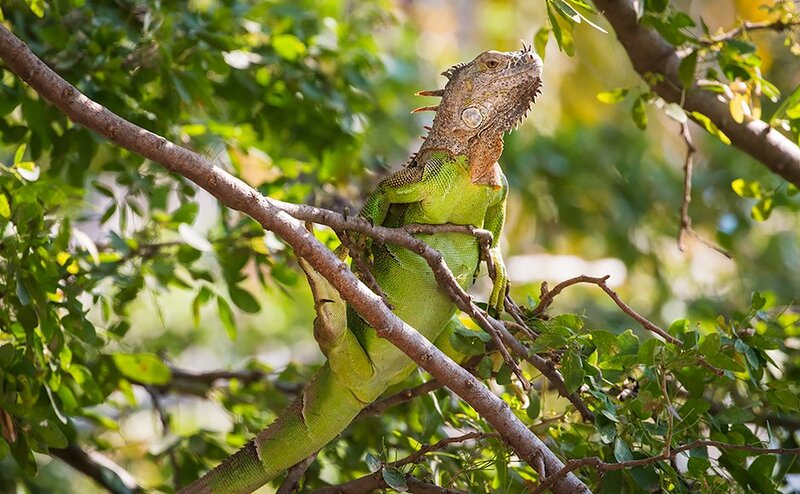 Speaking of iguanas… By far, the reptile you are most likely to see in Oaxaca’s Pacific Coast forests is the Western Spiny-tailed Iguana (Ctenosaura pectinata). A close second is the common Green Iguana (Iguana iguana). Spiny-tailed Iguanas live among rocks, whereas Green Iguanas prefer bushes and trees. 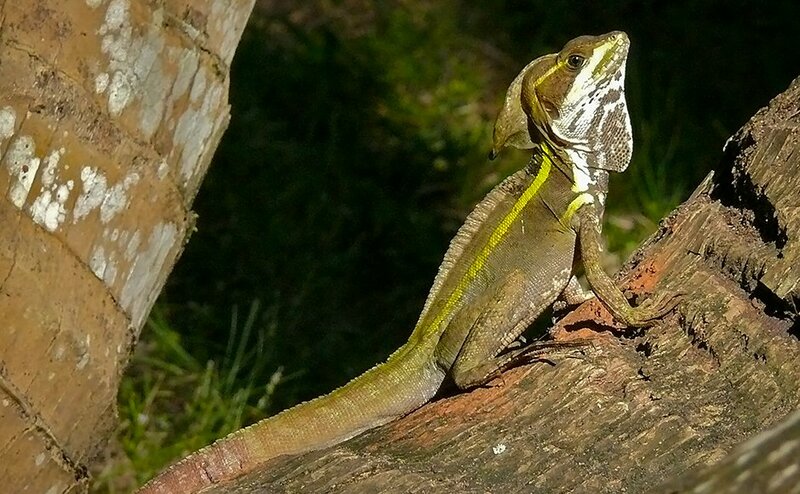 Another cool reptile is the Brown Basilisk (Basiliscus vittatus), a lizard that can run for short distances across the surface of water! The Marbled Toad (Incilius marmoreus) and the Mexican Giant Tree Frog (Agalychnis dacnicolor) are two of the more common amphibian species in this ecosystem. The latter will congregate to breed in temporary ponds or man-made pools during the rainy season. The deciduous forest is home to hundreds of bird species. Specialties here include White-throated Magpie-Jay, Golden-cheeked Woodpecker, Orange-breasted Bunting, Russet-crowned Motmot, West Mexican Chachalaca, and the Citreoline Trogon. There are many great birdwatching locations across this area. Many of the animals that are closely-associated with this ecosystem can be found in Huatulco National Park. This park is a refuge that preserves over 25,000 acres of tropical deciduous forest. Going down the northern slopes of the Sierra Norte, the forest transitions from pines and oaks to a humid, lush ecosystem called evergreen tropical forest. This forest is found between the elevations of 1,500 and 5,000 ft. Rainfall is plentiful enough here to support plants that hang onto their leaves year-round. Many of these plants also have very large leaves. This tropical forest is a great habitat for ferns, mosses, orchids, vines, and exotic flowering plants like heliconias. The combination of temperature and moisture suitable for evergreen tropical forest also works well for coffee plants and this zone is where many of Oaxaca’s coffee plantations are found. Skulking through the evergreen forest are mammals such as the Central American Red Brocket Deer, Collared Peccary, Spotted Paca, the critically endangered Mexican Agouti, and Deppe’s Squirrel. Several opossum species, such as the Gray Four-eyed Opossum, forage in the trees. Predators here include the Tayra, a large member of the weasel family, and some wide-ranging species found in other ecosystems, such Puma and Gray Fox. Reptiles and amphibians are plentiful in this forest type. Notable reptiles are the Mexican Jumping Pit Viper (Atropoides nummifer), Red Coffee Snake (Ninia sebae), Greater Scaly Anole (Anolis tropidonotus), and Brown Basilisk (Basiliscus vittatus). Fleischmann’s Glass Frog (Halinobatrachium fleischmanni) is a native amphibian with amazingly translucent skin. The Spiculate Toad (Incilius spiculatus)– an endangered species endemic to Oaxaca– is at home on the forest floor. Many fantastic birds are found in this ecosystem. 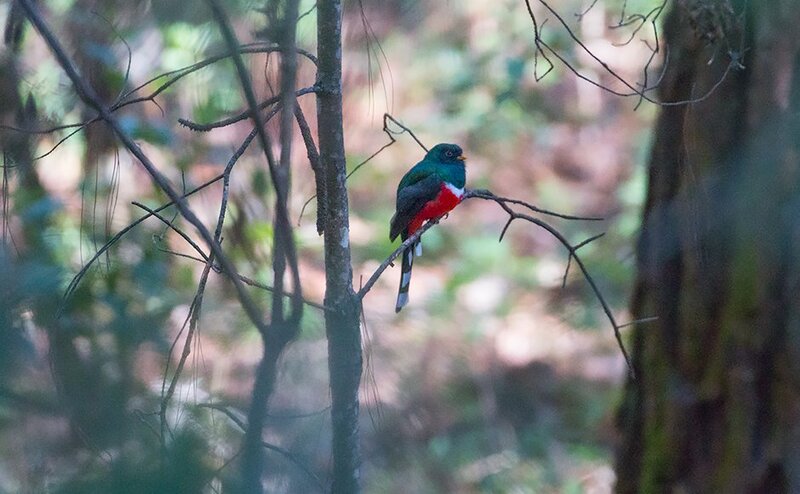 Among the many great examples are the Gartered Trogon, Collared Aracari , White-winged Tanager, Lesson’s Motmot, Band-backed Wren, Montezuma Oropendola, Red-legged Honeycreeper, and Emerald-chinned Hummingbird. A relatively small part of northern Oaxaca is occupied by true tropical rain forest. The City of Tuxtepec is surrounded by this ecosystem. Here, rainfall is abundant and temperatures are warm all year. Conditions are ideal for a riot of lush plant growth and a high diversity of wildlife. Dozens of tree species grow in this rain forest and few are what could be called ‘dominant.’ In other words: in any patch of forest you are likely to find a bewildering array of tree species without any that are noticeably more abundant than the others. Nevertheless, fig trees of various species are seemingly common and are conspicuous with their deeply buttressed roots. Mahogany trees are also important components of the rain forest. Another notable group of trees are those in the genus Manilkara. Their sap was the original source of chewing gum. Many plants that grow beneath the trees in this forest have large leaves. This allows them to maximize their ability to absorb sunlight in the gloomy understory. Vines and lianas crawl up trees and are seen draped across branches in all directions. As in so many other ecosystems, mammals of the rain forest are often secretive. This is true for the Ocelot, which is more common here than on Oaxaca’s Pacific Coast, but still hard to find. One charismatic mammal in the rain forest is the Central American Spider Monkey, which is sadly an endangered species. White-nosed Coatis roam these forests, too, as well as other mammals found in the higher evergreen tropical forests to the south. Some large reptiles lurk in the rain forest. Here you might find the Central American Crocodile or a Central American Boa. Lizards are abundant, including the tiny Brown Forest Skink, the Green Iguana, and many species of anole. 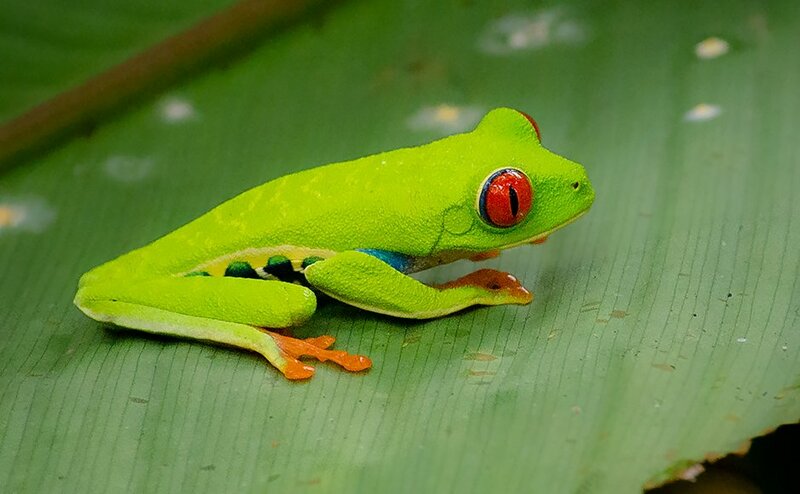 The Red-eyed Treefrog (Agalychnis callidryas) may be seen in Oaxaca’s rain forest. This amphibian is a true icon of the neotropics. Many other frog species are found here as well. The Mexican Caecilian (Dermophis mexicanus) is a strange, worm-like amphibian that burrows in loose soil and leaves on the forest floor. Birds are ever-present in the tropical rain forest, playing many important ecological roles, such as distributing the seeds of trees. Birdwatching in dense forest can be a challenge, but the rewards are great. Lovely species you mind find include Keel-billed Toucan, Olive-throated Parakeet, Amazon Kingfisher, Barred Antshrike, and Red-throated Ant-tanager. Hundreds of other species share this ecosystem. Oaxaca’s rain forest is highly fragmented, much of it having been lost to agriculture and logging. The rich diversity of this ecosystem is imperiled by this fragmentation because plant and animal populations are more likely to go extinct in small habitat patches. Plant diversity is particularly high in Oaxaca relative to the rest of Mexico. Over 8,000 native species grow here. Within the handful of major ecosystems discussed above are many different habitats for plants. These habitats vary in their combinations of moisture, temperature, soil qualities, and amount of sunlight. A short distance east of Oaxaca City is the town of Santa Maria del Tulé. 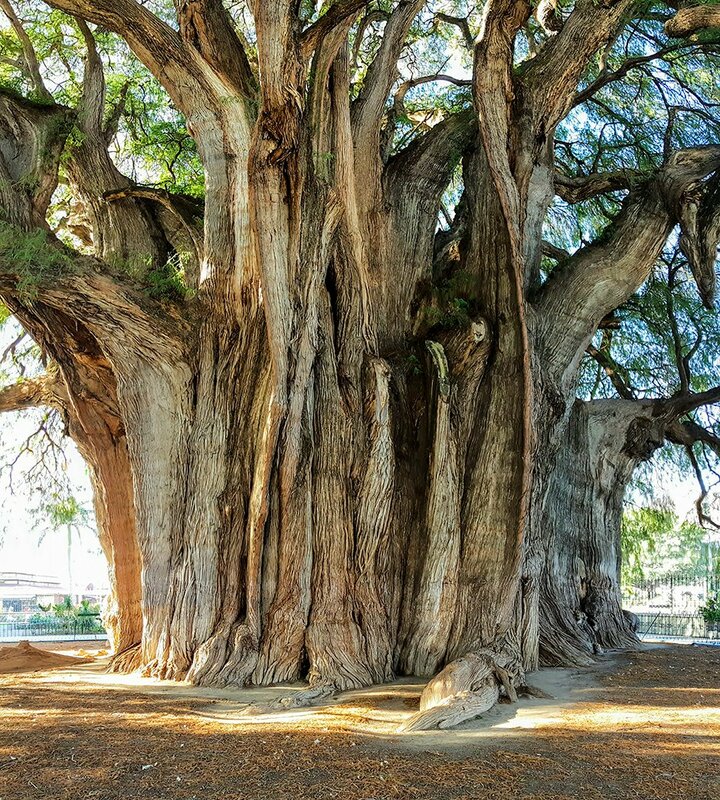 There you’ll find a massive Montezuma Cypress (Taxodium mucronatum) known as the Arból de Tulé. With a circumference of 138 feet, it has the thickest trunk of any tree in the world! Not only is this tree huge, it’s also very old. It is over 1,000 years old, but some estimates date it to over 5,000 years old. Montezuma Cypress is called ahuehuete in Nahuatl, an indigenous language of this region. This translates as the “old man of the water.” This name makes sense, given that this species grows in places with wet soil along rivers or near springs. Montezuma Cypress is Mexico’s National Tree. Over 700 fern species are found in Oaxaca. This is more fern diversity than exists in all of the United States. Oaxaca has delicate maidenhair ferns (genus Adiantum), leathery Polypodium ferns, the herb-like Limestone Adder’s-tongue fern (Ophioglossum engelmannii), and the towering Sphaeropteris tree fern. Ferns are found across all of Oaxaca’s ecosystems. Well-known author and neurologist Oliver Sacks wrote a fascinating book about his exploration of Oaxaca on a fern tour in 2000. The book is titled Oaxaca Journal and is a great read for the nature lover. It also has a wealth of interesting information on Oaxaca’s history and culture. Prickly plants in the family Cactaceae and the genus Agave are common in Oaxaca, as they are in much of Mexico. For many of us in the United States, the cactus and agave are icons of Mexico. Cactus plants are generally adapted to dry, sunny environments. In Oaxaca, they grow in the central valleys and in the tropical deciduous forest along the Pacific Coast. Prickly pears (genus Opuntia) are perhaps the most common, but over 100 species grow in Oaxaca and they have diverse shapes and sizes. Agaves are not closely related to cacti, but are also adapted to dry places. As with cactus plants, many agaves sport wicked spines to protect their water-storing tissues from being eaten by herbivores. Oaxaca is home to the largest Agave species in the world: Maguey Verde Grande (Agave atrovirens). A single leaf of this plant can be 14 feet long! 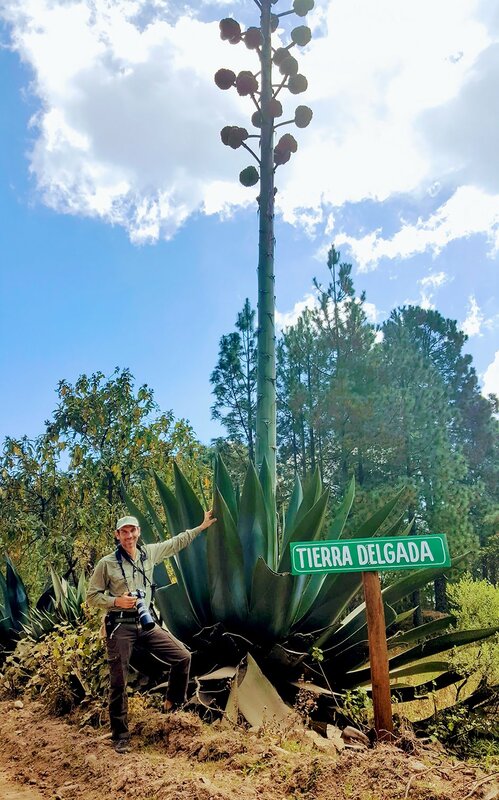 Ivan (the author) with a giant agave in the mountains of Oaxaca. Sometimes called century plants, many agaves grow for decades before ever producing flowers. Agaves reproduce only once, then they die. The distilled spirit called mezcal is a specialty beverage of Oaxaca made from agave plants. Technically, any agave species can be used, but about seven species are the most common sources of mezcal. This is unlike tequila, which is made from only Blue Agave. Spiky fields of agave can be seen along roads throughout the central valleys of Oaxaca. The animals you are most likely to see in the Oaxaca are birds. Birdwatching draws many people to this part of Mexico because there are lots of interesting and beautiful species to see here across a diversity of habitats. 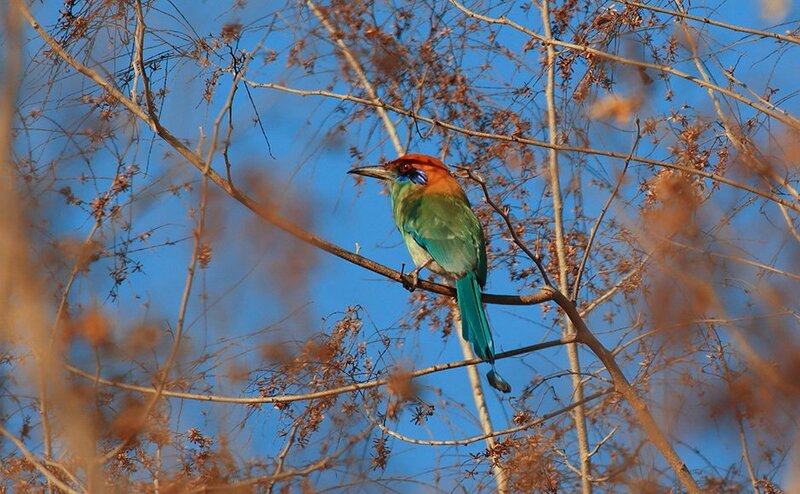 Over 700 bird species have been seen in Oaxaca– that’s about 68% of all the bird species known in Mexico. Over a couple weeks, it’s possible to see hundreds of these species on a birding tour of Oaxaca. Want to see amazing birds in distant lands? Check out our upcoming birding and nature tours. Our small-group tours are fun and focused on natural history. There are a few birds you can see only in Oaxaca. These geographically limited, local species are the state’s endemic birds: Oaxaca Sparrow and Oaxaca (Blue-capped) Hummingbird. 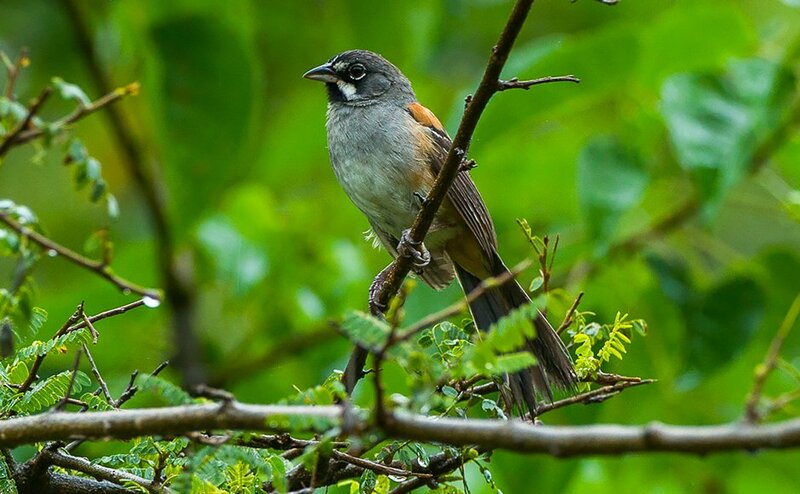 Near-endemics — species found in Oaxaca as well as some surrounding areas — include the Dwarf Jay, Gray-breasted Woodpecker, Bridled Sparrow, Boucard’s Wren, and Ocellated Thrasher. For birders, endemics and near-endemics are some of the most exciting birds to see. 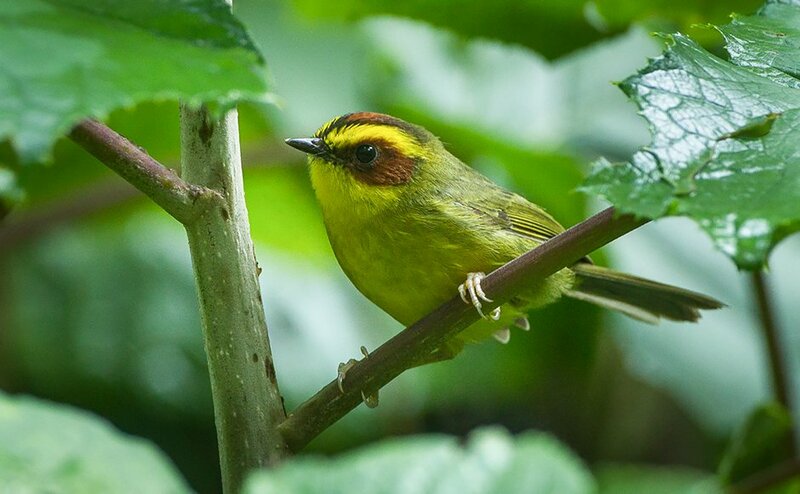 Some of the best places to look for birds are in the valley scrub habitats around Oaxaca City and the ruins of Monte Albán, in the Sierra Norte and Sierra Madre del Sur, and along the Pacific Coast. 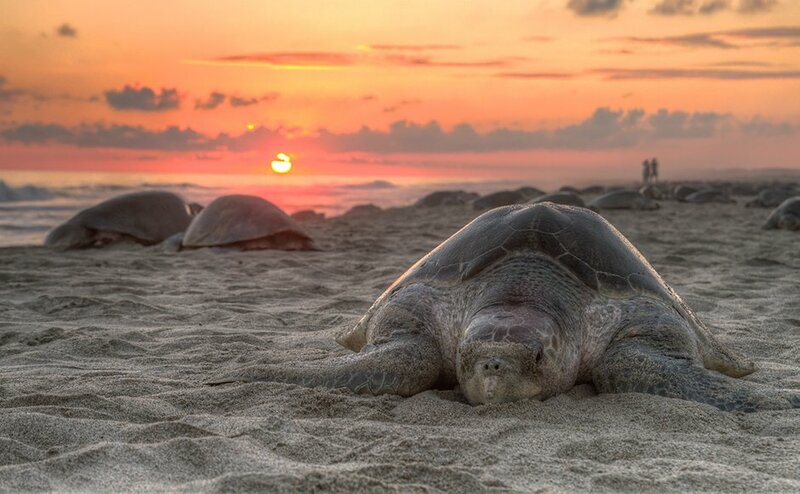 Oaxaca’s coastline is one the best places in the world for nesting sea turtles. These ancient reptiles hatch from eggs on the sandy beaches, crawl into the ocean where they spend many years, and then return to the same beaches to lay their own eggs. Several sea turtle species heave themselves onto Oaxaca’s beaches to lay their eggs: Olive Ridley, Leatherback, Green, and Hawksbill. The state-funded Mexican Turtle Center (El Centro Mexicano de la Tortuga) is located near Mazunte beach, a hotspot for turtle nesting. Nearby La Escobilla beach is the world’s largest nesting site for Olive Ridley turtles. These turtles come to shore between July and December during events called arribadas (Spanish for arrivals). Tens of thousands of turtles may emerge from the waves during an arribada. Besides being a sea turtle haven, Oaxaca is also a wonderful place to see other reptiles and amphibians. Roughly 100 amphibian and 200 reptile species are found in Oaxaca. Some, like the Western Spiny-tailed Iguana, are easily seen in many places. Most ‘herps’ (the term for reptiles and amphibians as a group, derived from herpetology or herptile), however, are skittish or secretive so it takes effort to find them in their natural habitats. Naturalists who enjoy seeing frogs, salamanders, snakes, lizards, and turtles will find it worthwhile to spend time poking around in the undergrowth or among rocks in Oaxaca. Many fascinating and/or rare species are there to be appreciated. Naturally, you must take care to avoid close contact with venomous snakes! As mentioned above, mammals are often the most difficult wild animals to observe. Most are active primarily at night, so even common species are rarely seen. Many are great at avoiding humans and some are truly rare. For these reasons, many of our encounters with mammals are the product of good luck. Still, some places are better than others for seeing mammalian wildlife. For example, Huatulco National Park on Oaxaca’s southern coast is a refuge for some species that are hard to find elsewhere in the state. The Northern Tamandua is one of the most charismatic and unusual mammals in the park. Look in the trees for these arboreal anteaters. They slurp up their insect prey with long, sticky tongues. High above Oaxaca City in the Sierra Norte, a 10 square mile expanse of the mountains is protected in Benito Juarez National Park. Spanning elevations between 6,000 and 11,000 feet, the dominant ecosystem in this park is pine-oak forest. The winding dirt roads in the park offer reasonably good access. A day of exploration here can yield many plants and animals special to this mountain ecosystem. This is the best place to look for the endemic Dwarf Jay. This national park is about an hour’s drive along the coast west of Puerto Escondido. It was designated to protect the wildlife living in and around five coastal lagoons. 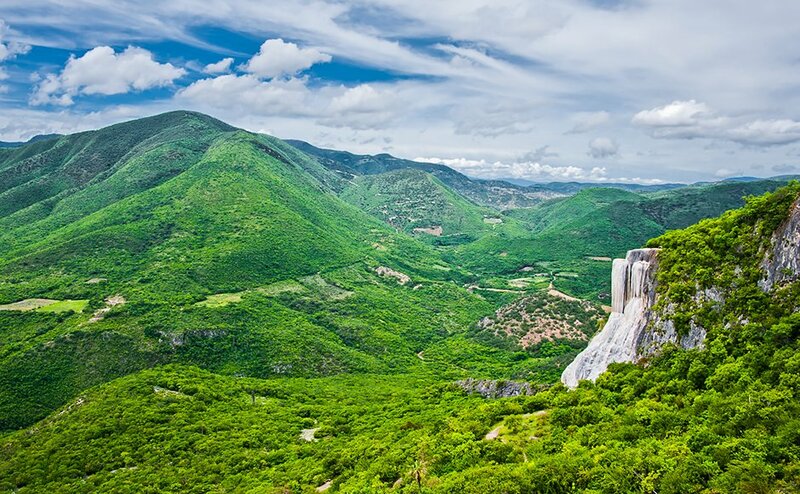 This is Oaxaca’s largest national park, covering 58 square miles. Several distinct habitat types are found within its boundaries. 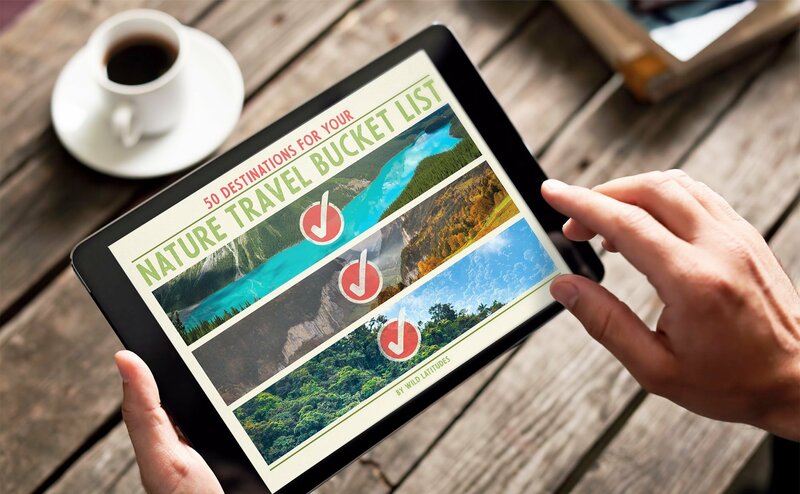 These include mangrove forests, coastal dunes, swamps, and spine forests. Hundreds of species of wildlife and plants are protected in the park. Some of the best low elevation tropical deciduous forest in Oaxaca is protected within Huatulco National Park. It is the newest of Oaxaca’s national parks, being designated in 1998. This 46 square mile reserve is home to many wildlife species hard to find elsewhere along the coast. You can animals here that normally live to the east and south. Examples are the Mexican Hairy Dwarf Porcupine, Tropical Mockingbird, and the Oaxacan Spiny-tailed Iguana. The latter is a critically endangered reptile that Huatulco National Park helps to protect.